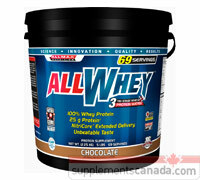 ALLWHEY is a low sugar, high protein powder that provides a 3-stage protein delivery. ALLWHEY provides 25 grams of pure whey protein per serving with reduced-lactose content. ALLWHEY™ combines the latest innovations in Whey Protein extraction technology creating the 3-stage NitriCore™ delivery system that delivers a 100% Whey Protein. The NitriCore™ delivery technology is designed to dramatically increase levels of Nitrogen retention in muscle tissue. ALLWHEY® is enhanced with OmegaEFA™ (a source of highly stable EFA essential fatty acids) and Tri-Blend Protein Digestive Enzymes that help in the assimilation and absorption of Whey Protein Peptides and amino acids. This proteolytic phase of digestion is essential in ensuring that you derive the maximum benefit from the Protein you consume. ALLMAX® ALLWHEY® gives you 100% Whey Protein Blend in a 3-Stage NitriCore™ Delivery System all with OmegaEFA™ and Tri-Blend Enzymes. ALLWHEY® is fully Instantized so it mixes easily and quickly in water or milk. 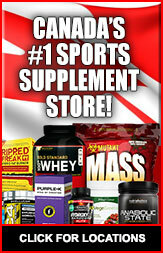 ALLWHEY® has an amazing taste that stands as one of the best flavored proteins on the market. NitriCore is a new 3-Stage extended protein delivery system that ensures 100% Whey Protein is extracted to deliver a high-quality source of whey protein per serving. The NitriCore™ delivery technology helps to dramatically increase levels of Nitrogen retention in muscle tissue. Increased Nitrogen Retention ensures that rapid muscle building can take place in response to increased training and helps to ensure that precious muscle tissue is not lost during recovery. ALLWHEY™ is enhanced with OmegaEFA™ (a source of highly stable EFA essential fatty acids) such as Cold-Pressed Flax Seed Oil, providing Omega 3 Essential Fatty Acids and Borage Oil, providing Omega 6 Essential Fatty Acids. ALLWHEY also contains Tri-Blend Protein Digestive Enzymes, such as Lactase, which is a lactose-reducing enzyme and Bromelain and Protease which are protein-digesting enzymes. Combined, these enzymes facilitate the assimilation and absorption of Whey Protein Peptides and amino acids. This preoteolytic phase of digestion is essential in ensuring that you derive the maximum benefit from the Protein you consume. ALLWHEY is fully Instantized, so it mixes easily and quickly in water or milk. ALLWHEY™ has an amazing taste that stands as one of the best flavored proteins on the market. cGMP is an acronym of "current Good Manufacturing Practices." cGMP is a form of standardized protocol used in the manufacture of pharmaceuticals, food and medical devices. cGMP was designed to ensure that processes performed, equipment used, in-process testing and end process testing comply within the standards through proper traceable documentation. At ALLMAX we have taken the steps to make sure that you are getting the purest, cleanest and best protein possible through every step of the process. In addition to cGMP we put every lot through a wide range of testing; we know that this is not officially “required”, but we won’t make it any other way, and you shouldn’t settle for less. cGMP is just one more way we hold ourselves accountable to a higher standard.